lily, i have a question for you: have you ever done an entry on the schwestern floge -- emile floge and her sister? i am very interested in the clothes they made for their shop but have had very little success trying to find images of their couture. you seem to have the most amazing library maybe you have pictures of their creations? well, you were right, and thank you for a very interesting day of research! here's what i've pieced together today, and i'll quote some websites too. first, i went through all of my books -- something like seven -- books on that one period, and found something like three photos in a book about koloman moser, and fewer, if any, in the rest. but reading the books, then spending a lot of happy if occasionally frustrating hours on the internet, i learned a lot of interesting things. regarding her designs, i found only one reference to her designing (the dress in her painted portrait), and having read all the rest, i wasn't sure i believed that. i think the situation was this: he designed the fabric, and suggested structure in the paintings, and perhaps she turned them into actual clothes. the dress in the above photo is definitely credited to him. the artists in japan designed clothing in much the same way, and i think this is yet another example of the influence of the east. 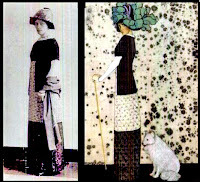 Emilie Flöge, Gustav Klimt's friend and model, was 28 when she posed for this painting. 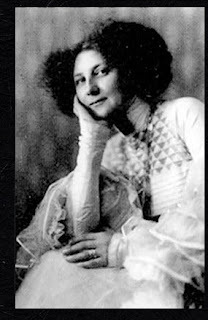 She was soon to create the very successful Viennese fashion house, Schwestern Flöge, that she directed from 1904 to 1938. With her thin face, azure blue eyes, steadfast gaze and body draped in a typically extravagant "Klimtesque" dress, Emilie Flöge in this portrait is the perfect embodiment of the new turn-of-the-century Viennese beauty. The painting is one of several portraits of women (Damenbildnis) that were shown in 1903 at the Klimt Kollektive exhibition, an event that marked the beginning of a new stylistic era in Vienna for this art form. an interesting website that looks at some of this is here. as you can see, there are contradictions everywhere. the link for #2 above is a really rich, comprehensive website. and for me, i think i'll see if the library has that book! I have heard about three blogs getting book deals lately, Lotus, and won't be surprised when you become one of them. thankyou so much for a day of research, you are amazing. 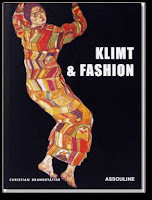 isn't is odd that the fashion house/dress shop "schwestern floge" apparently existed for 30 years and there is almost no documentation of the work that came from that atelier? i can only imagine how wonderful the clothes, and fabrics, must have been. yeah, and so little mention of her sister too.... well, the good news is that the library does have that book, so i'll see what it has, and also, now that i'm thinking of it, i'll look for some others on that subject too. and will report back. Are you going to tell? BTW I will be in Berkeley soon. It took me longer than I thought to get over the cough I had. I didn't want you to think I wasn't looking for the CD you mentioned. 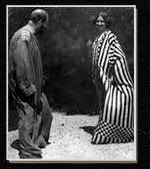 Soon..
Klimt painted 3 portraits of emile floge. Her first at 17, then 19 and of course her most famous one at 28. They probably did have a relationship when the 3rd portrait was painted, as her gaze is directly at the viewer which refers to her sexuality. The younger portraits of emile floge contrasts against her sexuality as she does not engage with the viewer or even shows any of her personality. ship or not, emile grew up to be a strong woman who knew what she wanted.